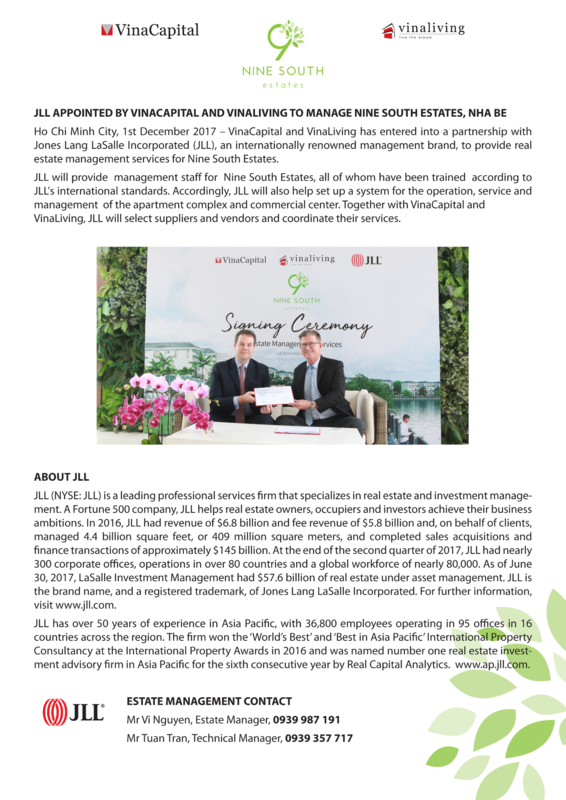 Ho Chi Minh City, 1st December 2017 – VinaCapital and VinaLiving has entered into a partnership with Jones Lang LaSalle Incorporated (JLL), an internationally renowned management brand, to provide real estate management services for Nine South Estates. JLL will provide management staff for Nine South Estates, all of whom have been trained according to JLL's international standards. Accordingly, JLL will also help set up a system for the operation, service and management of the apartment complex and commercial center. Together with VinaCapital and VinaLiving, JLL will select suppliers and vendors and coordinate their services. JLL (NYSE: JLL) is a leading professional services firm that specializes in real estate and investment management. A Fortune 500 company, JLL helps real estate owners, occupiers and investors achieve their business ambitions. In 2016, JLL had revenue of $6.8 billion and fee revenue of $5.8 billion and, on behalf of clients, managed 4.4 billion square feet, or 409 million square meters, and completed sales acquisitions and finance transactions of approximately $145 billion. At the end of the second quarter of 2017, JLL had nearly 300 corporate offices, operations in over 80 countries and a global workforce of nearly 80,000. As of June 30, 2017, LaSalle Investment Management had $57.6 billion of real estate under asset management. JLL is the brand name, and a registered trademark, of Jones Lang LaSalle Incorporated. For further information, visit jll.com. JLL has over 50 years of experience in Asia Pacific, with 36,800 employees operating in 95 offices in 16 countries across the region. The firm won the ‘World’s Best’ and ‘Best in Asia Pacific’ International Property Consultancy at the International Property Awards in 2016 and was named number one real estate investment advisory firm in Asia Pacific for the sixth consecutive year by Real Capital Analytics. www.ap.jll.com.